This boyfriend's a keeper! 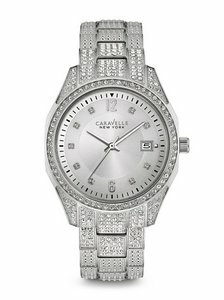 In stainless steel with 248 individually hand-set crystals on bezel, dial and bracelet. Silver-tone dial with crystal markers. Fold-over buckle closure. Case Diameter: 36mm. Case Thickness: 10.5mm. Water Resistance: 30M.